John William Brown was born on 5 July 1878 in Texas. He married Mary Lee Bay, daughter of John Edwin Bay and Stacy Scott Teague, circa 1907. The following appeared on 23 May 1909 in the Galveston Daily News: Mr. and Mrs. John Brown of Teague visited the latter's parents, Mr. and Mrs. John Bay, several days. John William Brown and Mary Lee Bay appeared in the US federal census of 15 April 1910 in Teague, Freestone County, Texas, at West Main Street. He was a locomotive fireman, according to the 1910 census. Mary Lee Bay and John Brown and their daughter Eloise appear formally and informally, about 1917. John William Brown and Mary Lee Bay appeared in the US federal census of 1 January 1920 in Teague, Freestone County, Texas. He was a railroad hostler, according to the 1920 census. John William Brown and Mary Lee Bay appeared in the US federal census of 1 April 1930 in Teague, Freestone County, Texas, at Oak Street. 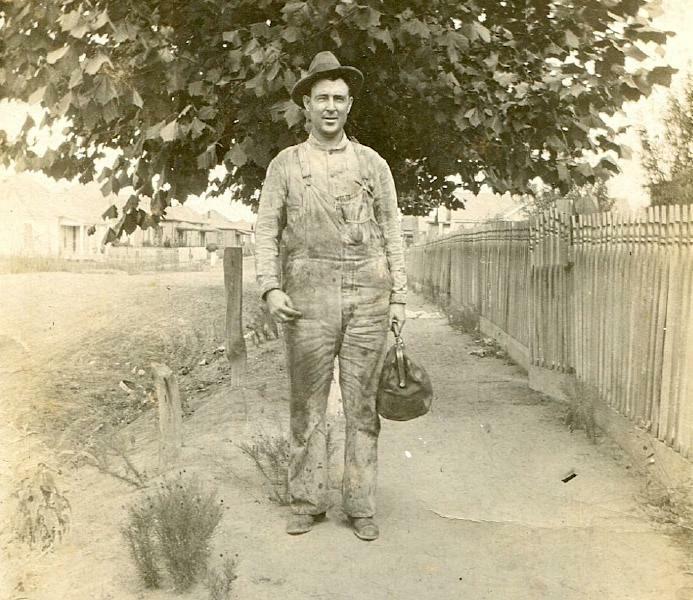 He was a locomotive fireman for the steam railroad, according to the 1930 census. He officially witnessed the death of Marguerette Jane Curry on 27 January 1936 in North Zulch, Madison County, Texas. John William Brown and Mary Lee Bay appeared in the US federal census of 1 April 1940 in Teague, Freestone County, Texas, at Sixth Avenue. Other members of the household included William Buford Lee Chiles and Johnnie Eloise Brown. His wife Mary Lee Bay became a widow at his death. John William Brown died on 5 July 1940 at age 62 in Teague, Freestone County, Texas, . His death was officially witnessed by Johnnie Eloise Brown. A single grave marker identifies the graves of John William Brown and Mary Lee Bay.